Nka Foundation announces a call for entries for its 6th Earth Architecture Competition: Designing a Classroom of the Future, an international design competition open to practitioners and advanced students of architecture, design and engineering from around the world who think that earth architecture can be designed to stand the test of time. This is the design problem: What should a classroom designed and built in rural Africa look like to stand the test of time? The shortlisted entries will be built as units of the Abetenim High School for students of ages 12 to 18 years in the Ashanti Region of Ghana. Besides travel prize for the three winning designs, the competition offers construction opportunity for all shortlisted designs. Total costs of constructing the design entry must not exceed $13,000 (USD) for materials and local labor. The entry fee is $40 for individual entry and $60 for team entry. In order to enter the competition, you must register at goo.gl/qSFY7r before October 30, 2018 and submit your design entry at nkaprojects.boards.net on November 2, 2018. Join us! Make your name known. 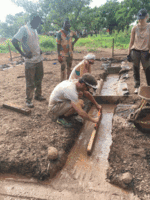 Show the world how to reinvent the African mud house! Contact organizer at info@nkafoundation.org / www.nkafoundation.org if you have any question or concern. The cause has been this: In the traditional areas of West Africa, the recurrent problem with local buildings made of earth is sustainability, structurally. The local perception in Ghana is that mud buildings are only for the very poor. However, their opinion is not ungrounded. Mud houses in the rural areas are poorly constructed; wall cracks and water damage due to poor construction are commonplace. The Abetenim rural area has many examples of cob constructions which have eroded over time due to poor construction and water damage. Hence, the local stigma associated with earth architecture persists. We reason that the design-build workshops can help generate alternatives to resolve the problem. 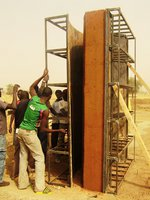 Together with past international architecture workshop leaders, Nka Foundation has experimented with vernacular cob construction known as atakpame, mud brick method, poured earth and rammed earth walls with successful results. Many structures are in place on our project sites in Ghana, Tanzania and Gambia. Nka Foundation has come to know that, on the international front, some stereotypes also exist about contemporary sustainable architecture. From building the winning designs in our past earth architecture competitions, sustainable architecture that involves the use of ephemeral materials such as grass, bamboo, palm leaves and mud wall exposed to the elements, do not stand the test of time. The 6th Earth Architecture Competition is therefore a design and build competition. The challenge is to come up with a design option in response to the question: What should a classroom designed and built in rural Africa look like to stand the test of time? Join us! Make your name known, as a sustainable designer. (1) Multi-purpose room: a large classroom is also called an assembly hall or lecture hall, which may be incrementally built in two or more workshops; (2) a general classroom of 48 sq metres per 30 students; or (3) a special classroom of the subject-specific type of 80 sq metres for about 60 students, such as Chemistry Classroom, Biology, Physics and Geography classroom. Roof design should involve metal roof involving corrugated zinc or aluminum roofing sheets, which are the conventional roofing material in the region. The roof should be designed in a way that will withstand the region’s torrential rain storms. The classroom type may have some or all of the following features: storage space for school supplies, office for the teacher, chalkboard, and an outdoor social space for reading. The desks for the teacher and the students will be supplied by the local district government because the school by name is Abetenim High School, which is a public secondary school. Keep in mind that you are designing for the tropical climate. And spatial devices such as cross ventilation, setting the house foundation at two feet above the ground level, and designing the roof to overhang by at least four feet will therefore be in order. The land for the construction is of a slight slope, it slopes northward; and the ground is of red earth. Yelp, the design entry is to emphasize the principles of designing a classroom for the tropical climate and cost-efficient construction by fully integrating the poured earth construction method and passive solar design. The classroom type should be designed for construction by maximum use of earth and local labor. Total costs of constructing the design entry must not exceed $13,000 (USD) for materials and local skilled labor. The project is community architecture; by this, the local community will supply unskilled local labor for the construction and land value is also excluded from this price point. Because the construction of best design entires is a priority, each team of a shortlisted entry gets an opportunity to build their design at Abetenim in Ghana. Be a part of this! Let’s create social change where it is most needed. InsideOut School, 2nd Prize Winner in the 4th Earth Architecture Competition. Architects and Builders: Andrea Tabocchini and Francesca Vittorini from Italy. A Travel Prize to Build Your Design in Ghana! The design team of every shortlisted and winning entry will receive a commemorative certificate and an opportunity to build their design in Ghana or Gambia in collaboration with Nka Foundation. The selection jury consists of administrators of architecture institutions and architects, some of who have led building workshops with Nka Foundation. The jurors will use judging criteria involving functionality, aesthetics and technical matter to select three prize-winning designs. Because the construction of best design entries is our priority, jurors will award travel prizes for first, second and third place consisting of a trip to Ghana to build the design. Specifically, the 1st prize involves cash prize of $500 or flight ticket for 1 member of the design team (in case the winner does not reside in Ghana), and accommodation for up to 3 months for all members of the design team to build their design in Ghana. The second prize involves cash prize of $300 or the opportunity to build your design in Ghana, which covers 50% of the flight ticket for 1 member of the design team and accommodation for up to 3 months for all members of the design team to build their design in Ghana. And the third prize is $200 or the opportunity to build your design in Ghana or Gambia, which covers accommodation for up to 3 months for all members of the design team to build their design. Honorable mentions may be awarded at the discretion of the jury but will receive no cash prize. The registration fee per entry is $40 for individual and $60 for a team. Here is where to register: goo.gl/qSFY7r and registered teams will be provided with a link to submit their design Online at least one week before the submission deadline. For additional information, see the competition discussion board: nkaprojects.boards.net. Throughout the year and in different countries in Africa, Nka Foundation runs earth architecture workshops and arts projects that invite professionals, students, and others from around the world to immerse in the local culture and learn-by-interaction with the local community through the onsite projects. Students can use the opportunity for internship, thesis or personal research. 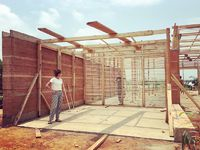 Specifically, our program involves immersion in the design-build process based on site in a village in Africa in response to the design education question: How do you learn to design what is buildable? The answer is this: it is by designing and building your design! Nka Foundation has come to know that by immersing the young designers in the full circle of designing and building their own design, at the completion of the design-build process, the emerging professionals will learn to design what is buildable to make a well-rounded graduate. For the professional, you will find the hands-on construction experience a pause from your office work to rediscover the rudiments of design and nuances that can refresh your practice. Simply stated, the construction of the top design entries in the competition is a priority for two reasons: (1) The building workshop serves for cultural exchange to enable your design team to learn by immersion in the rural environment to interact with the local lifestyle as you build your unit of the school with the rural youth trainees and local artisans; and (2) it is self evident that one way for a young designer to learn to design what is buildable is by immersion in the full cycle of designing and building own design on site in a village in Africa, where they are given some autonomy. Thus, from May 2019 to November 2021, we will be collaborating with some of the design teams in the competition to organize construction workshops to build their design entries based on site at Abetenim village in the Ashanti Region of Ghana. The competition promotes open source design, which implies that the submitted designs will be available for all to appreciate, use, or improve them to generate more practical and contemporary design solutions for the region. In light of this, the competition entry needs to be a type that can be replicated in another village in tropical Africa such as Gambia, Ghana or Tanzania. Our long-term goal is to enable the rural population and lots of other places, to overcome the stigma that earth architecture is architecture for the very poor. Mud Cafeteria, Shortlisted Design in 4th Earth Architecture Competition. Architects and Builders: Jaap Willemsen and Anna Schweiger from Austria. What is the preferred construction method for the winning entries? 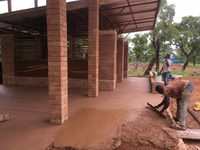 Nka Foundation has experimented with vernacular cob construction, mud brick, rammed earth and poured earth method of building. 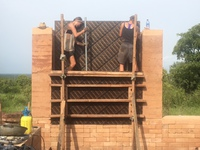 We found out that cob, mud brick and rammed earth methods are labor-intensive and time consuming. We aim as we go, to simplify the building process with a focus on poured earth, which is often referred to as cast earth construction. The poured earth process is a simple and easily learned building method. 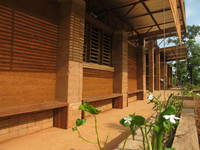 It is of much lower labor costs than mud brick or rammed earth, and its compressive strength is comparable to concrete. Poured earth relies on the traditional process of shuttering and mold making. The mixing and pouring process is similar to construction by concrete formwork. The main difference is that instead of the sand and gravel used as an aggregate in concrete, poured earth uses ordinary soil, which may be red earth, black or sandy soil, and generally uses Portland cement as a binder. By adding a binder such as cement or quarried dust, most types of soil can be used for poured earth building. An aggregate such as gravel or quarried stone may be added to improve the quality of the soil, depending on the soil map. Structurally, a best mixture for poured earth is 60% laterite (red earth), 40% quarried stone, and water; or 80% laterite (red earth), 8% cement, 12% gravel or stones, and water. It will be just right, if the wall is cast at 14 to 18 inches thick. The consistency of the mixture should be same as the local masons mix concrete, ask the local mason for guidance. In the project, poured earth and cast earth are interchangeable terms; the two terms are used herein to mean the same thing. 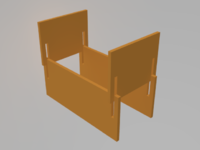 Plastering or painting the cast wall is not necessary, if metal formwork is used in pouring the wall because the surface of cast wall is smooth. Yelp, you may use quarry dust (crushed stone) in place of cement. Once the formworks are in place, casting the corner walls for a classroom may take just two days to realize. The Nka Foundation manual for poured earth construction is available to the competition participants. 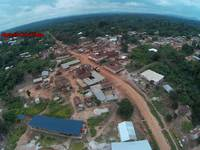 The design entries will be built on site at Abetenim village in the Ejisu-Juaben District (http://ejisujuaben.ghanadistricts.gov.gh) in the Ashanti Region of Ghana. Abetenim is about 40 kilometres from Kumasi, which is the second largest city in Ghana. Abetenim occupies a geographical area of about 4 km by 5 km with most of the land covered by green vegetation. Abetenim was formally known as nkoa kuro (slave camp). This was because during the days of Western colonialism, people who were captured during battles were camped here and sold out as slaves. The village was later named Abetenim (village of palm trees) because of the many palm trees on the land. Today, the population is about a thousand people, with 60% of them between the ages of 1 to 25 years. The current Paramount Chief of Abetenim is Nana Owusu II. The standard of living is rather low. The village is dotted by mud house types, built in ways that tell of abject economic poverty. The people of the village are essentially farmers with few of them producing cooking oil from the palm fruits, which they sell to traders from far and near. The local language is Twi. About 98% of the adults in the village are unable to read or write proficiently because they did not gain elementary school education. Abetenim used to have only a primary school, which is grade 1 to grade 6. Children on graduating from the primary school had to stop schooling. The main excuse was because the closest junior high school they could attend was in Juaben. 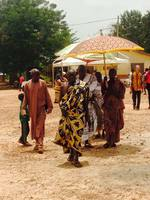 Those children eager to continue schooling had to walk to Juaben to attend school. With Nka foundation coming to the village, the village now has its own junior high school which was built through the contributions made by visitors of the Foundation. The junior high school now has a total of 52 pupils and 8 teachers. Abetenim is situated on a flat land off a laterite road from the Juaben Township. The top soil is red earth mixed with gravel, which is an ideal proportion for poured earth or cob construction. The primary means of transportation in Abetenim and the nearby villages are tro tro and taxis service. Fortunately, a taxi driver lives in Abetenim; we hire his service as needed. In Abetenim, you can access the Internet with pen drive wireless connection, which is a service provided by most regional phone companies. Power is by public electricity. What are the lodging options and nearby facilities? In general, we provide accommodation at the Abetenim Arts Village at highly subsidized cost to our workshop participants and we provide free accommodation to our workshop leaders during the period of the workshop. There is running water and indoor toilet and bath in the 9 accommodation units in the Abetenim Arts Village. Those interested in upscale accommodation can stay at a newly built Guesthouse at Juaben Township. 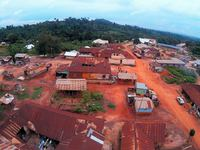 Juaben has a government hospital, banks, library, Courthouse, oil mill, k-12 and vocational schools. There are also many churches, running water, electric grid and other amenities typical of a growing township. The body of jurors for the competition will to listed below by October 30, 2018. Nka Foundation is an organization in USA that serves underserved communities in Africa through arts and design projects involving workshops, competitions and conferences. The works of Nka Foundation began in 2005. From 2008 through 2010, Nka Foundation organized workshops and symposia in partnerships with some institutions in Ghana and Mali to stimulate conversations and artistic interventions for solutions to the problem of tapping of the abundant local resources for sustainable development in sub-Sahara Africa. By 2009, we felt a deep need to create a model arts village at Abetenim that can be replicated in other parts of Africa, to continue to address the problem through design-build workshops, arts workshops, design competitions and outreach to the local community by means of school building projects and education enrichment. The arts village is designed as a learning center with focus on skills development training in the vocational arts and design to provide relational spaces for creative people from the region and other countries to live, work, learn and create. Nka Foundation’s rural projects draw on asset-based approach to community development by immersing in the community and by mobilizing the existing, but often unrecognized abundant local resources to enable the underserved community drive its own development process. For this reason, throughout the year and at different sites, Nka Foundation runs earth architecture workshops and arts projects that invite university students, professionals and others from around the world to immerse in the local culture and learn-by-interacting with the people through the onsite projects. Students can use the learn-by-doing opportunity for internship, thesis or personal research. Take the design challenge! To Nka Foundation, designing is not the whole thing. The competition invites projects from individuals, school teams and organizations who find substance in what we are doing. Since 2010, we have collaborated with architecture and design practitioners from around the world to realize their projects, from design to built environment, based on site in rural Ghana, Gambia, and Tanzania. (1) An individual or a design team can submit an entry to the 6th Earth Architecture Competition. In this design and build competition, each design team should not consist of more than three individuals. Each team shall identify one team member as its Point of Contact (“Point of Contact”) during the submission process. Each entry shall receive a registration number and, from then on, will only be identified by that number, in order to keep anonymity during the submission and the final election. (2) In order to enter the design contest, you must register here on Eventbrite: goo.gl/qSFY7r On your Eventbrite ticket, you will see a 9-digit order #. This is your registration number for one design entry. If you are submitting more than one entry, each design entry requires a separate ticket. With your entry ticket number upload your design entry to the competition board: goo.gl/n3CEAi on November 2nd, 2018. If you want to pay by check, send us an e-mail at info@nkafoundation.org / www.nkafoundation.org and the following information: team name, team leader name, phone number and email address. To submit your design, place your ticket number and the title of the project (no name) on all pages of your design submission to allow the jury to select blindly. (3) Permanence of construction materials is key; the competition disallows the use of ephemeral or temporary building materials that would perish in a year or two. The life expectancy of every material used in the construction of the classroom design must be at least 30 years. (4) SUBMISSION FORMAT: Submission should include: (i) The design statement (200 words max) should include the meaning of the work, material description and budget in USD; and (ii) One A1 presentation board submitted as a JPG file of high resolution (1 MB). The upper right corner of the board must contain the entry ticket number. There should not be any marks or any other form of identification, less the entry is disqualified. The file must be named after the ticket number. For example, 112334567.jpg (for your presentation board). Submissions must be in English language. Submission of the design statement and the One A1 presentation board will be Online, to be uploaded to nkaprojects.boards.net and email a 15 MB version of your A1 presentation board to mudhousedesign@mail.com to the attention of the competition jury. (5) Of the shortlisted projects (30), there will be three winning projects, according to the highest scores. Jurors will award prizes for first, second and third place consisting of a commemorative certificate and travel prizes to the winning designs as follows: 1st prize- $500 cash or construction of design in Ghana plus a trip to Ghana for a workshop to build the winning design (in case the winner does not reside in Ghana and to a maximum of 1 person); 2nd prize- construction of design plus 50% of the flight ticket or $300 cash; and 3rd prize- $200 or construction of design. Honorable mentions will be awarded by the jury but will receive no cash prize. Every design team that makes the Top 30 Entries shortlist will be offered the opportunity to build their design in Ghana in collaboration with the competition organizer. If a design team of the shortlisted entries is not able to lead the workshop, the design team or competition organizer may nominate a practitioner or an organization to lead the workshop to build the entry. Otherwise, the organizer of the contest will pass the opportunity to another team whose entry in the competition is a good fit for the project site. (6) Judging criteria involve: (1) Form: Visual appearance through use of materials, shape, color, texture, etc; (2) Function as a sustainable classroom design; and (3) Technical issues to the degree the design addresses construction techniques, climatic factors and construction budget. Decisions of the jury will be final and binding. (7) Q&A: Registered participants may post questions for organizer to respond to and they can share materials on the competition discussion board: nkaprojects.boards.net. The deadline for questions is September 30, 2018. (8) Any person entering this contest shall certify and guarantee the organizer that he/she is the sole author of the project and by participating, each contestant grants their free and exclusive consent that all designs and ideas will be published and shared to inspire others. By entering the competition, all participants agree to all the conditions of participation in the competition. (9) After, you have uploaded your entry Online, send us a note via email to mudhousedesign@mail.com / info@nkafoundation.org that includes the following information: a high resolution image (10 MB) of your design, and the entrant’s personal information including your name, registration number, profession, address, and email address.